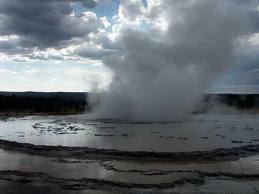 — (TRN) — A seismometer inside a borehole at Yellowstone National Park has begun reporting staggering underground activity near the southwest corner of Yellowstone Lake, possibly signaling the beginning of an eruption of the Super Volcano at the Yellowstone National Park. TRN has obtained the image of the Seismograph report and now YOU can see it for yourself! This could be very nasty. . .
Yellowstone lake is pretty much the center of what is the Yellowstone Caldera; the mouth of a massive Super Volcano, located beneath the park. The activity began around 12:00 Noon, Mountain Standard Time (MST) on February 1, and was detected by a seismometer in Borehole B944 then continued, non-stop, all day yesterday getting worse and worse as the hours wore on. The activity is continuing right now at 6:06 EST AM as this news article is being produced. The map below shows the location of Borehole B944 in relation to Yellowstone Lake and the rest of the park. Seismographic Printout from Yellowstone National Park, Bore Hole #B944, for February 1, 2014. The time stamp goes down the left edge. Look at what starts happening from 12:00 Noon for the rest of the day. By 3:00 PM MST, things get real dicey; by 5:00, it is clear there’s real trouble happening underground. By 7:00 PM, the seismographic gear is totally overwhelmed; with all readings going utterly off the scale. This could be a sign that a massive eruption of the Yellowstone Super Volcano has begun deep underground. A second printout shows the activity continuing to this very moment, so severely that the seismometer printer is RUNNING OUT OF BLUE, BLACK AND GREEN INK! Here is a Topographical map showing the mouth (« Caldera ») of the Super Volcano and the scarred, treacherous terrain, created by past eruptions. (Click Image to enlarge). The park boundaries are the thin Yellow line, the Caldera of the super volcano is shown by the thin Red line. Bear in mind that seismometer B944 is just next to the area labeled ‘West Thumb » on the map, showing the western edge of Yellowstone Lake. That puts this seismic activity right smack in the active zone of the actual caldera. A recent program aired by the British Broadcasting Corporation (BBC) *** THEORIZED *** what an eruption of Yellowstone would affect. Below is the *** THEORETICAL *** blast, damage and volcanic ash fallout area, which is shown in various shades of Orange. If this is the start of an eruption at Yellowstone, the entire northwest quadrant of the country could be affected by damage and disruption beyond human comprehension. We will monitor this story closely.